Dr. Marzano cover four content areas and all grade levels. Each game identifies the appropriate grade level and subject area, as well as whether or not the students should already be familiar with the vocabulary. 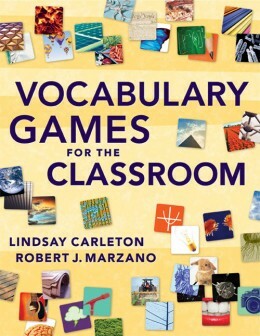 Find instructions for 13 vocabulary games spanning grades K–12. Gain hundreds of key vocabulary terms and phrases in four subject areas—language arts, math, science, and social studies—compiled from Dr. Marzano's work with schools, districts, and states. Understand the importance of a strong vocabulary from early grades through high school and in all subject areas. Discover practical suggestions for incorporating vocabulary into all subject areas in fun ways.